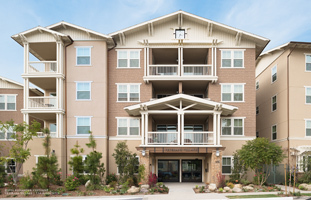 Veterans Village of Glendale is a new 44-unit, tax credit community located in Glendale, CA. Preference is provided for U.S. veterans and their families. The waiting list is currently closed. The one, two and three bedroom units feature vinyl hardwood flooring, wall-to-wall carpeting in the bedrooms, air conditioning, window blinds, a private patio or balcony, and a kitchen with a range and oven, refrigerator, dishwasher, microwave and waste disposal. Residents enjoy access to a spacious community room with a full kitchen, fitness room, computer lab, television room and laundry facility. The property also offers on-site management and maintenance staff. Other amenities include lushly landscaped courtyards, outdoor barbecue areas and secured, underground parking. Activities include exercise classes, after-school programming, financial literacy classes, scholarship programs, field trips, and monthly parties. Veterans Village is conveniently located to public transportation, health facilities, community services, parks, restaurants, and shopping centers including the Glendale Galleria and the Americana at Brand.